The threat of Somali piracy has been greatly reduced by international naval patrols, improved security measures for ships, and the increased use of armed guards aboard vessels. However, a long-term solution, which empowers Somali security forces to suppress piracy (and also illegal fishing, terrorism, and human/drug/weapons trafficking), remains elusive. International donors and private security companies have engaged in several different initiatives to build coastguard capacity in Somalia over the last decade, but few have shown sustainable gains. As a kickoff to CIMSEC’s Future African Navies Week, this article examines the trials of building maritime security capacity in the country most desperately in need of it. Lessons are drawn from past successes and failures with a view towards informing future policy. 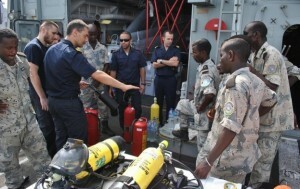 EU personnel train with the Djiboutian Coast Guard, but who does one work with in Somalia? An onshore solution to Somali piracy has been, at least rhetorically, a focus of the international community since the crime wave reached crisis-level proportions in 2008. While significant progress has been made in developing the maritime security capacity of regional states, Somalia itself remains largely sidelined. Multilateral initiatives such as the Djibouti Code of Conduct and a UN trust fund for Somalia have solicited funds and policy prescriptions for a Somali coastguard, but have yet to contribute to a training or procurement program. NATO’s Operation Ocean Shield has conducted training observation and joint exercises with states such as Yemen, Oman and Djibouti, but its engagement with authorities in Somalia remains confined to humanitarian assistance and consultation. The region’s largest capacity building initiative is the European Union’s EUCAP NESTOR, which has provided ongoing coastguard and judicial training to authorities in Djibouti, Kenya and the Seychelles since 2012. Though the mission is mandated to assist in the development of a coastal police force for Somalia, this has not yet been initiated due to Somalia’s fragile political arrangement and unstable security situation. Security risks, arms embargo restrictions, and the absence of legitimate local partners have prevented national governments from deploying maritime trainers in Somalia. These same factors, however, have carved out a unique niche for private security companies (PSCs) eager to venture where no one else will. Somalia’s successive transitional federal governments have been the focus of several attempted coastguard projects, all of which have failed to materialize. In 2005, the Transitional Federal Government (TFG) signed a $50-million contract with U.S. security firm Top Cat to hunt for pirate ‘motherships’ and train a Somali coastguard. The U.S. State Department blocked the deployment, however, because it was judged to violate the 1992 arms embargo on Somalia as well as U.S. arms-trafficking regulations. The TFG signed a similar deal with the French PSC Secopex in 2008, but the required funding—assumed to come from the international community—never arrived. A failure to secure international funding also aborted the coastguard procurement plans of Nairobi-based security provider Halliday Finch in 2012. In late July 2013, the new Somalis Federal Government (SFG) announced that it had signed a deal with Dutch private maritime security provider Atlantic Marine and Offshore Group to establish a coastguard to combat piracy and secure Somalia’s exclusive economic zone. Though no timetable or funding source has been announced, the deal has already provoked a hostile response from the autonomous states of Puntland and Somaliland, who view the contract as an infringement on the sovereignty of their territorial waters. Somaliland and Puntland’s hostility towards a Mogadishu-based coastguard in part stems from the fact that they have already, with external assistance, established their own marine police forces. In 2006, the self-declared state of Somaliland engaged the services of Norwegian PSC Nordic Crisis Management (NCM) to increase safety, security and revenue at the port of Berbera by implementing International Ship and Port Facility Security Code standards. The firm’s contract also involved training Somaliland’s harbor security and marine police forces and consulting on coastguard procurement. The fact that organized piracy did not take root in Somaliland and that NCM was able to complete their five-year contract without serious interruption attests to the success of the project. Private security experts have attributed this feat to the stable funding the project received from the Norwegian government and NCM’s ability to maintain good relations with government and opposition authorities (enabling the contract to survive a change in government in 2010) and to avoid becoming involved in clan/political disputes. The neighboring autonomous state of Puntland has also engaged several foreign PSCs to help build its maritime security capacity, with a mixed record of gains and setbacks. In 2000, the Puntland government contracted the British PSC Hart Security to help suppress illegal fishing and piracy as well as build up the capacity of the local coastguard. Though it achieved some success in curtailing maritime crime, Hart was forced to withdrawal from Puntland in the face of an internal civil conflict in 2001-2002, a fight in which its own recruits were split by opposing clan loyalties. The company was soon replaced by the Somali-Canadian Coast Guard (SomCan), a locally based outfit with strong ties to the clan of the newly emerged Puntland president, Abdullahi Yusuf. Lacking an external financier, SomCan’s contract was funded through the sale of fishing licenses. This led to clashes between coastguards and fishermen from different clan backgrounds. SomCan’s restrictively close links with a single clan is regarded as the seed of its downfall, as the company’s contract did not survive a change in presidency in 2005. A much more ambitious project was born in 2010 when the government of Puntland president Abdirahman Mohamud Farole entered a contract with the South Africa-owned PSC Saracen International (later Sterling Corporate Services) to train and procure equipment and vehicles for a large Puntland Marine Police Force (PMPF). Unlike previous initiatives in Puntland, the PMPF was financed by the UAE, allowing it to quickly grow to a force of some 500 marines supported by a fleet of small ships, aircraft, and armored vehicles. After engaging in a number of humanitarian projects, the PMPF commenced security operations in March 2012, disrupting pirate bases across the remote Bari and Bargaal regions. This allowed the government to enter negotiations with local authorities and denied pirates their onshore sanctuary, contributing to a dramatic decline in Puntland-based piracy. In late December 2012, the PMPF succeed rescuing 22 sailors held hostage aboard the MV Iceberg, the only indigenous security force to conduct such an operation. 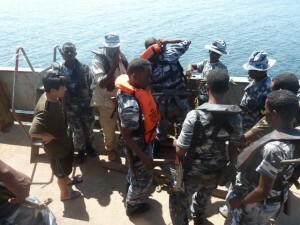 The PMPF detains a North Korean vessel accused of illegally dumping cement in Somali waters. Though operationally successful, the PMPF suffered several political and financial setbacks. The United Nations Somalia and Eritrea Monitoring Group alleged that the force was in violation of the 1992 arms embargo on Somalia because of the vehicles and equipment procured by Saracen/Sterling and the UAE’s failure to disclose its financial support to the UN Security Council. In June 2012, the UAE froze funding for the PMPF, leading to the exit of Sterling Corporate Services and the temporary halt of operations. UAE financing has since resumed, but there are now concerns that the PMPF is becoming entrenched under the personal control of the Farole administration and has been used, on at least one occasion, as tool of political oppression. With the PMPF now at a crossroads, both the EU and UN Monitoring Group have expressed hope that Somalia’s most capable marine police force will be integrated into a Somalia-wide security regime. With donor states and PSCs now announcing renewed commitments to help build a Somali coastguard, several lessons can be gleaned from past failures and successes. First, capacity-building efforts should not take a top-down, Mogadishu-centric approach. All past attempts to do so have failed, and the most recent initiative by Atlantic Marine Offshore Group appears poised to damage fragile relations between the SFG and the country’s autonomous regions. While the SFG does require its own maritime police forces, these should be built up in tandem with support to existing coastguard forces in Somaliland, Puntland, and other federal states. While their operations and areas of responsibility would be autonomous, it is important that federal maritime security programs be coordinated together with a future view towards further integration. While donor states and PSCs must be careful to balance relations between the SFG and Somalia’s autonomous states, they must also seek to manage or avoid potential conflicts within them. Both Hart and SomCan’s contracts in Puntland were brought down by political impediments and inter-clan conflict. This offers a warning for the PMPF, as the appointment of president Farole’s son as the force’s commander is reportedly a source of factional tension with the region. Somaliland offers a positive lesson, as NCM was able to continue operations despite a change in government because it had made a prior effort to build relations with opposition parties. Somalia and its regions have a great need for maritime security forces, but are unable to fund their training and provision with minimal government budgets. Several Mogadishu-based coastguard contracts (Top Cat, Secopex, Halliday Finch) have failed to launch because there was no outside party ready to fund their large budgets. An often-tried scheme is to fund coastguard operations through the sale of foreign fishing licenses, but this risks exacerbating political/clan tensions by placing a revenue generating activity under the control of one group at the expense of another. A more stable option, as witnessed by the PMPF in Puntland and NCM in Somaliland, is for an external donor state to fund capacity building projects as part of a larger development/security agenda. It is important that financing remain consistent, however, as there are several past examples of trained coastguards turning to piracy or other criminal activity once their wages disappeared. Finally, it is imperative that efforts to build up maritime security forces in Somalia are enmeshed in larger peace-building and governance initiatives. NCM’s contract in Somaliland, for example, succeeded not only in repelling pirates, but also in increasing revenue and trade at the port of Berbera. The PMPF was able to deliver humanitarian assistance to remote regions that had been largely inaccessible to the central government. There is no shortage of donor states (the UAE, UK, Norway ,and Japan in particular) and international organizations (the EU, NATO, IMO, and Djibouti Code of Conduct) with a pronounced willingness to help develop Somalia’s coastguard capacity. Though national coastguard or naval trainers are unlikely to set foot in Somalia, PSCs have demonstrated their eagerness to accept adequate compensation for this inherent risk. As new capacity-building efforts commence in Somalia, they will not be entering the anarchic wasteland that the country is often portrayed to be. Pockets of onshore and littoral security have already emerged in Somaliland and Puntland and can be further strengthened by coordinated international effort. The challenge will be greater, but not insurmountable, in areas where pirate authority still holds sway, such as Hobyo and Haradhere, and in the politically contested southern port of Kismayo. With Somalia’s pirate gangs on the back foot, the time to solidify these gains is now. International organizations, donor states, PSCs, and local authorities must work together to ensure that legitimate coastguards, not pirates calling themselves such, are left in control of Somalia’s waters. James M. Bridger is Maritime Security Consultant and piracy specialist with Delex Systems Inc. The opinions and views expressed in this post are his alone and are presented in his personal capacity. 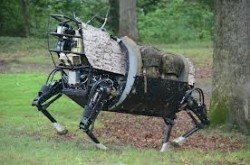 It’s a MULE, not a cow. It’s also composite metals, not gold… but technology may be a Golden Cow. And when the people saw that Strategy delayed to come down from the mountain, the people gathered themselves together unto Convention, and said unto him, Up, make for us Purpose, which shall go before us. As for this Strategy, the man that brought us up out of the land of Defeat, we know not what is become of him.Convention said unto them, “Break off the golden epaulettes, which adorn the shoulders of your commanders, your assistants, and of your peers, and bring them unto me. And all the people brake off the golden epaulettes and brought them unto Convention. He received them and fashioned it with a graving tool, after he had made it a molten calf: and they said, These be thy Purpose, O People, which brought thee up out of the land of Defeat. And it came to pass, as soon as Strategy returned from speaking to the true Purpose upon the mount, he came nigh unto the camp, that he saw the calf, and the dancing: and Strategy’s anger waxed hot, and he cast the mission objectives out of his hands, and broke them upon the rocks of the mountain. He took the calf which they had made, and burnt it in the fire, and ground it to powder, and strawed it upon the water, and made the people drink of it. It tasted like crow. 4-8 November is Sacred Cow week. Come down from the mountain and lay waste to the idols of convention you have seen that have been put before true purpose in strategy, military operations, tactics, or the broad diplomatic, legal, and financial processes necessary for maintaining maritime security! Is the surface fleet standing in the way Submarines as a primary sea weapon? Are you an Army advocate unsure why the Marine Corps exists when the Army has more ships than the Navy? Are you a Marine who thinks, actually, no, why do YOU still exist, Army? Are you in the Navy wondering why those Army ships even exist? Are you in the Royal Navy and wishing you HAD some of those ships? Are you someone who wonders why some states even bother with separate branches? Do you think the global carrier building boom is misguided? Stealth Fighters, Dress Uniforms, Counter-Piracy, NATO, Electronic Charts, ASCM, basing… we are looking for corrections to what YOU think are our mistaken premises. The think-tank C4ADS recently published a new study, The Odessa Network: Mapping Facilitators of Russian and Ukrainian Arms Transfers, which analyzed commercial maritime networks linked to the Russian state and their involvement in arms shipments, particularly those to Bashar al-Assad’s forces in Syria fighting in that ongoing Civil War. The report received some additional publicity when it formed the meat of a 7 September Washington Post story, with discussion especially devoted towards the report’s analysis of Automatic Identification System (AIS) data, claiming that vessels likely carrying arms from the Ukrainian port of Oktyabrsk were turning off AIS when traveling to Syria. The piece goes into great detail to lay out the various networks that Russia uses to ship arms, composed of interlocking companies headed and/or controlled by individuals with links to the state. What’s unclear is why that should be considered unusual or bad. Shell companies, convoluted ownership, and Flags of Convenience are commonplace for a variety reasons (many business-related) in the maritime industry. It is not much of a “So What” to reveal that cronies in the maritime industry would be the facilitators used by Putin’s Russia to ship weapons to a pariah state. (Of note for those interested in topics like Flags of Convenience, Rodney Carlisle’s Sovereignty for Sale is a good read which explains the creation of the famous Panamanian and Liberian registries and provides context on why ship “ownership” is rarely straightforward in the maritime industry). Russian arms shipments to Assad’s forces in Syria are clearly “bad,” but the implication in the Odessa Network study is that not only is Russia doing something bad, but that they are also doing it in a particularly devious and underhanded way. The data provided by Wallace and Mesko only proves, however, that Russia is choosing to use “discreet” means to ship weapons to Syria. It’s not clear that the Odessa Network’s ties to the Russian state or its business practices are that particularly egregious or unusual within the maritime industry. The authors look at both publicly available data regarding Russian arms shipments as well as AIS data. According to available data for ships/shipments, they note that “publicly known maritime weapons shipments from Russia to Syria” departed from “northern Russian ports of St. Petersburg or Kaliningrad.” They then claim, however, based on the curious absence of AIS data for Russian ships in the eastern Mediterranean originating in Oktyabrsk, that there is “a strong circumstantial case that these ships and companies are moving weapons or other sensitive cargo to the Assad regime.” The argument is inconsistent. 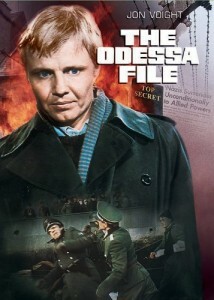 On one hand they make a case that operational security concerns or potential EU pressure on the Ukrainian government is stopping the use of Oktyabrsk as a transshipment site for Syria-bound arms, while on the other hand claiming that nefarious Russian intent is demonstrated by ships originating in Oktyabrsk deliberately not broadcasting AIS data when traveling to Syria. Can both these assertions be true at the same time? While certainly suspicious, is it actually illegal to turn off AIS as these Russia ships have allegedly done? The authors point out that there is the possibility that data may not be available in certain locations due to a lack of receivers, but also note that the eastern Mediterranean is not exactly an isolated area, and that AIS on these ships seems to work quite well everywhere else in the world. According to the UN’s International Maritime Organization (IMO), “all ships of 300 gross tonnage and upwards engaged on international voyages, cargo ships of 500 gross tonnage and upwards not engaged on international voyages and all passenger ships irrespective of size” shall “maintain AIS in operation at all times except where international agreements, rules or standards provide for the protection of navigational information.” These rules were implemented as part of the International Ship and Port Facility Security (ISPS) Code, as part of the International Convention for the Safety of Life at Sea (SOLAS). Although there is no real chance that these rules could be enforced against Russian ships since they are adopted and enforced by IMO member states themselves, are these ships doing something illegal by not using AIS properly? Could operators of these vessels be subject to penalties? Could enforcement of these rules be a round-about way to stop Russian arms shipments to Syria? Despite my minor criticism above, this sort of analysis is welcome and could be applied to a variety of other maritime issues. More publicly available detailed network analysis of the commercial networks benefiting from oil theft in West Africa or Somali piracy could provide new, non-kinetic policy or law enforcement options in the fight against these illicit activities afloat. Similarly, the methods toward which Iran has been driven by sanctions to facilitate its oil exports could be a useful subject of interest to analysts and policy-makers alike. Much has been made in the media of the Russian naval presence in the eastern Mediterranean. With tensions rising over the Syrian conflict, the notion that Russian forces are staring down their American and British counterparts at sea fits the popular narrative of mutual antagonism. But is the Russian Navy’s Mediterranean task force all that unusual? Does it present a challenge or even a threat to the United States’ interests in the region, as some reports would suggest? First of all, it is important to note that a Russian naval presence in the eastern Mediterranean is not unprecedented. From 1967 until its collapse, the Soviet Union maintained a task force of considerable size in the region, consisting of some 30 warships and an undetermined number of additional support vessels. Furthermore, Russia’s naval facility in Tartus, Syria was established in 1971, regularly providing repairs and maintenance for Soviet and later Russian ships. In contrast, the Russian presence newly formed in the eastern Mediterranean is quite limited in its size and capabilities. The task force currently consists of twelve vessels: two destroyers, one frigate, two amphibious assault ships, three salvage tugs, a repair ship, and three re-fueling tankers. The long-term presence envisioned by the Russian defence ministry consists of no more than ten vessels. This is a dramatically reduced presence to the one put forward by the Soviet Union. The Priazovye, a reconnaissance ship deployed to the eastern Mediterranean by the Russian Navy in September 2013, will operate separately from the existing task force and is intended only for the short-term surveillance of the situation in Syria. Despite the relatively small size of the Mediterranean task force, the Russian Navy reportedly struggled to find the resources to deploy a task force at all. When the United States Navy has deployed task forces on various operations, the vessels employed are usually drawn from the same fleet. But the Russian Navy’s Mediterranean task force is drawn from four of the country’s five fleets: Baltic, Northern, Black Sea, and Pacific. Only the Caspian Flotilla – a small contingent itself – did not contribute to the Mediterranean force. Had the Russian Navy followed the American practice of drawing from a single fleet, it would have left one of its fleets dangerously under-strength. This is a testament to how limited Russia’s naval capabilities have become in recent years. Ropucha Class large landing craft. Another important point regarding the Mediterranean task force is how dated some of the vessels are. The two Ropucha-class landing ships provided by the Baltic Fleet were originally commissioned for the Soviet Navy in 1975. An ambitious procurement project, intended to replace some of the aging Ropucha-class vessels with several of France’s Mistral-class amphibious assault ships, had its launch recently postponed until 2016. If the project eventually comes to fruition, the Mistral-class ships will be deployed with the Pacific Fleet. In short, while the technology in the eastern Mediterranean task force is seriously behind the times, there are no substantive plans on the part of Russian policymakers to update the force. Rather than seeking to intimidate ‘the West’, the deployment of the eastern Mediterranean task force seems to be more a gesture for domestic audiences in Russia. In 2011, the authorities released some highly optimistic plans for the expansion and modernization of the Russian Navy, envisioning almost a complete overhaul of this military branch by 2020. The implementation of these plans has been lacklustre thus far, as demonstrated by the aforementioned difficulties with only the partial replacement of the Ropucha-class landing ships. The formation of a new task force allows Russian policymakers to feign progress on this front and assert that Russia is reclaiming ‘past glories’, deflecting criticism from the government’s procurement problems. But this fresh coat of paint won’t long conceal all that rust. A more realistic plan for the development of the Russian Navy is desperately needed. This was originally published 12 SEP 13 at the Atlantic Council of Canada.